My son was born at the end of January, about a week before the due date and certainly earlier than I was expecting (first babies are more likely to be late). The delivery was under not-ideal circumstances as I had to rush into hospital (nearly had to go in an ambulance, but a lift appeared right on time) and 12 hours later had an emergency cesarean section. 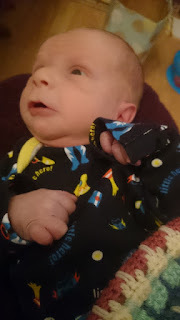 I was in hospital for a week after the birth as the baby had feeding issues initially and then my blood pressure went right up and I had to be monitored and put on medication before I could be discharged. I'm still being checked regularly and have to take medication, though it's being reduced now so hopefully I won't be on it for a lot longer. We've now been home a couple of weeks and I'm settling into parenthood with loads of help and support from my wonderful husband, who has gotten 6 weeks off work. We're both pretty tired, but I think we've got the basics sorted out and we have support from local family and friends. I'm not sure I'm fully enjoying all the changes yet, but I'm sure that'll come as I feel better and the baby grows. I haven't been outside of the house much since being discharged from the hospital, just a couple of trips round the corner so far. We have had various guests and lots of well-wishes, which is nice, turns out having a baby makes you kinda popular. We do have plans to get out of the house more, including visiting a few relatives in a different part of the country and going to register the baby in the city centre. Plus there are various baby groups/sessions in the local area. I do still need to figure out how to operate all the foldy bits on the pram and how best to handle it on the bus (I've seen a lot of people using prams on the bus, there are times it looks tricky).